I think I knew I was gay a long time before I allowed myself to know that I was gay, and even then it was a while longer before I accepted the fact. It’s not that I ever thought being gay was wrong. I was fine with other people identifying as gay—and I never understood the arguments against making gay marriage legal. I didn’t learn what being gay meant until I was in the sixth grade. Back then, anything that made you different also made you an easy target for bullies. The sixth grade was also the first time I questioned my sexuality—but I didn’t really care about dating then, so it was fairly easy to convince myself I was straight. Following middle school, being gay didn’t seem as big a deal. A few guys came out in high school, and no one even blinked. Yet, if my mind ever wandered back to questioning my sexuality, I was quick to assure myself that I was indeed straight. My junior year of high school came with a few major life changes, and I started struggling with depression and anxiety. I wasn’t sure who I was anymore or who I wanted to be. My depression told me a lot of lies. Most often it told me that what was OK or acceptable for other people wasn’t for me. It was OK for anyone else to get less than an A on an exam, but it wasn’t OK for me to get below a 93. It was OK for anyone else to cry, but I was never allowed to. It wasn’t OK for people to treat each other poorly, but I was allowed to bully myself all I wanted. The summer following graduation, I began to let myself entertain the possibility that I was gay. The thoughts about whether or not I liked girls quickly added fuel to my struggle with depression. It convinced me it was perfectly fine for other people to be gay, but not for me. I was an altar server for almost ten years in the Catholic church—it was a sin for me to be gay. Yet I never felt any of this toward my friends who identified as LGBTQ+. The day after the tragic Pulse nightclub shooting, it was raining. I took the little girl I was babysitting (we’ll call her “C”) to a local pottery painting studio. She painted a ceramic dog and I painted a plate. I was feeling tense and angry, and I wanted to put a quote on my plate about love and equality. Google wasn’t inspiring me and so I sat for a while to think, finally deciding to write the phrase “Love Belongs to Everyone” across the piece of pottery. C asked me what I meant by this. Not wanting to explain a mass shooting to a seven-year-old, I told her that everyone deserves to be loved for who they are—no matter what—and so love must belong to everyone. She deemed my explanation acceptable, and so we went on with our day. In the fall of that same year, C sent me a ceramic piece to hang on the wall of my college dorm room. She had made it in her art class at school. On it, she had stamped the words “Love is for Everyone.” I read the declaration over and over again, letting tears fall down my face. Depression told me I wasn’t enough, it told me I was a burden, it told me that I wasn’t worthy of love. When I had first written that phrase down, I hadn’t included myself as part of the “everyone.” But seven-year-old C gave me my words back and reminded me that love belonged to me, too. I was worthy of being loved. 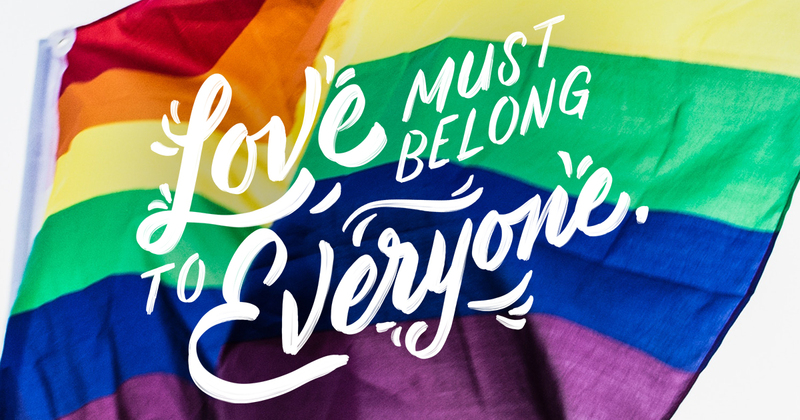 I was worthy of loving others—regardless of my sexuality. I was, I am, and I always will be worthy. Love belongs to you and me. Love belongs to the people who feel they are not enough. Love belongs to the kids who grow up wondering why they’re different. Love belongs to the person reading this right now. And now I’m crying. This piece is not only beautiful, but it shows the innocence we are born with. I don’t know you, but I love you and accept you for who you are! I myself am gay so I know how it feels to feel unloved for being gay. I have struggled with this I felt like I wasn’t good enough. So thank you for writing how I feel in this beautiful piece. Oh Erin thank you! The funny thing is that I’m straight and I feel the same way. Thank you for your beautiful declaration! This article is my all time favorite. I can relate to this. This article is the first thing I saw when I first came on here. Love to you. You are brave and honest and real.